This remembrance day, spare a thought for those whose lives are shattered or disrupted physically or mentally by active service. The Sport and Performing Arts Injury Clinic works with many men and women from our armed forces and civilian emergency services and actively supports the charity Hounds for Heroes. 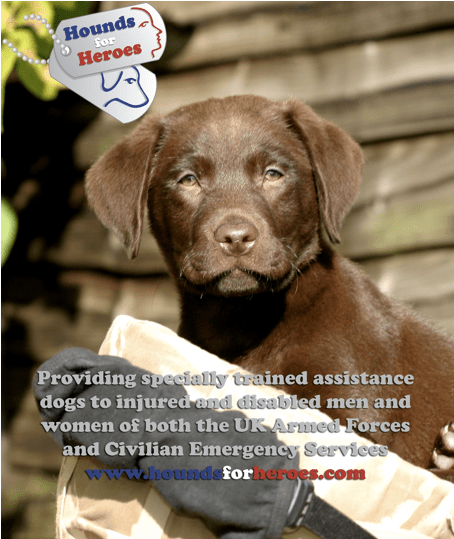 The purpose of Hounds for Heroes is to provide specially trained assistance dogs to injured and disabled men and women of both the UK Armed Forces and Civilian Emergency Services. Through this provision their aims are to provide help and practical support leading to an enhanced quality of life for their clients. If you are thinking of taking part in any sporting events in 2014, then you may wish to consider Hounds for Heroes as your chosen charity. Sponsorship forms are available in our surgery reception or you can simply log on to to Hounds for Heroes website and download the forms and information you need. Hounds for Heroes are currently looking for donations of dog hiking boots and people to be puppy parents in the Petersfield area.